When you want to purchase authentic jewelry, to commemorate a special occasion or relationship, how can you know whether the piece is actually worth the sales price? There are millions of people who will be too busy to read the information I’m sharing today. And guess what certain big-box jewelry-sales companies are banking on for their enormous end-of-year profits? Consumer ignorance. Entrepreneur gemologist Craig Nann of Newport, Rhode Island, owns Gemstones Unveiled. 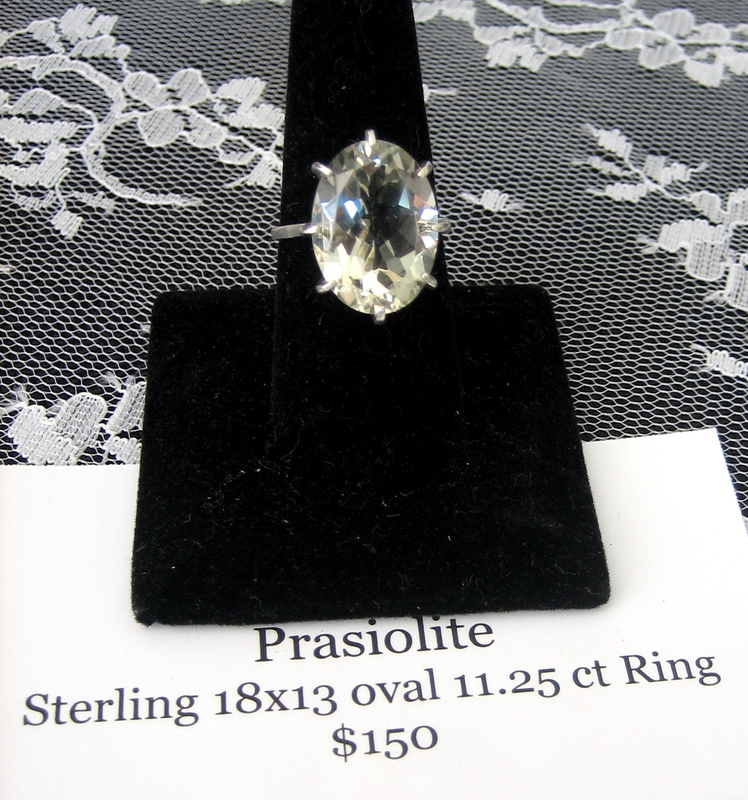 Assisted by his wife, he offers custom-designed gemstone jewelry at almost unbelievably fair prices. They also provide clients with an education in the truth about the actual value of gems. I recently spent a number of hours talking with them about the gemstone business. This is extremely valuable information. Please share with everyone who will be investing in jewelry this holiday season. When you want to purchase authentic, not costume or simulated jewlery, to commemorate a special occasion or relationship, how can you know whether the piece is actually worth the sales price? Is this stone mined or manufactured? Has the stone been manipulated? What is the quality of its color? Has the color been designed? What makes this stone unique? What can you tell me about the inclusions? If you are given any evasive or non-answers; pass on the purchase. You want mined stones, not manipulated, and if the color is designed you want that disclosed, along with clarification of how/why it adds to the stone’s value. 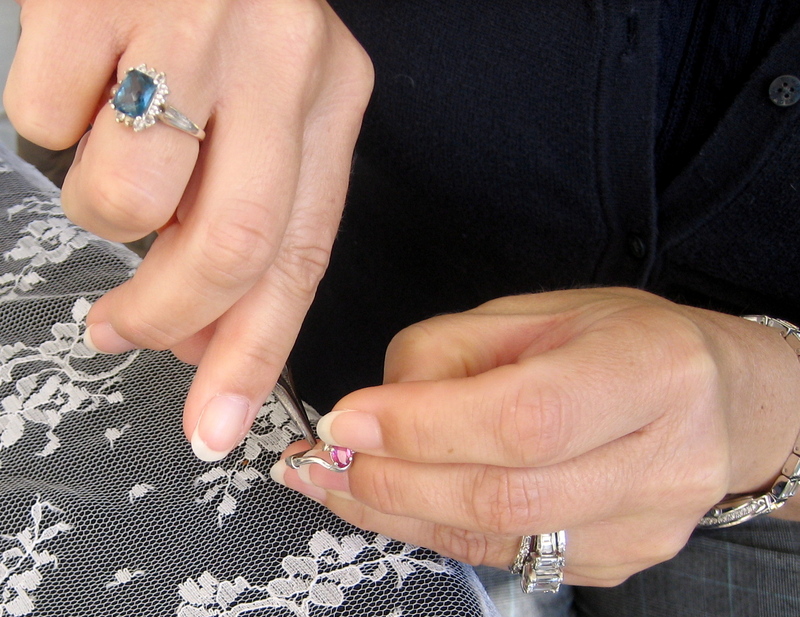 Your jeweler should be able to tell you about the stone’s origin, its story/history, and its cut. You want to know about the inclusions, the intriguingly beautiful geologic fingerprints which assure that your stone is not a mere trinket or bauble. When you invest your hard-earned money into real jewelry, you or your loved one will pass it on to children and grandchildren as an inheritance and an heirloom. How would you feel if some future jewelry expert/gemologist told your descendants, your ancestor got duped? People get duped because gemstones are status symbols. Why do they confer status? Because authentic stones have intrinsic value. Since ancient times, all across the planet, they have been prized for their beauty. And today real gemstones are accepted worldwide as assets–they are tangible proof of wealth. Throughout much of history, it was easy to recognize stone value–if it looked like a gem, it had to be a gem. It was practically impossible to counterfeit a gemstone. Investing your wealth in gems used to be a low-risk, safe bet. But these days, appearances are deceptive. Today, manufacturers are capable of producing increasingly more convincing fakes. How many people really know the difference between the appearance of a gemstone necklace worth $20,000 and one that sells at Zales for $1000? And how can you determine whether that “bargain” neckless is actually over-priced? Not knowing can lead to costly, and potentially humiliating, purchasing errors. Do you know about simulated gems? They’re made of exactly the same compounds found in corresponding mined stones. Therefore it’s perfectly legal to label them emerald or sapphire or garnet because chemically, they are. But here’s the sucker-punch: while simulated stones are awfully pretty; they are not intrinsically valuable. They are incredibly sophisticated simulations of gemstones, in other words–reproductions; copies; forgeries; fakes. When something is precious, of limited supply, its value increases. The 170-carat Black Prince Ruby, set in the center of Great Britain’s Imperial State Crown is priceless bcause it is a one-of-a-kind mined gemstone. Just as elephant ivory, now that there are few elephants left in the world, is valuable and protected because of its rarity. But when there are hundreds-of-thousands of exactly the same manufactured thing, those things become commonplace, ordinary, practically worthless on the open market. Confederate currency printed to sell in tourist shops, for example is worth no more than the paper it’s printed on; and beanie babies are worth less than people paid for them; and mass produced jewelry made of glass/plastic/simulated-gems are risky investments, because their value is dependent upon their fluctuating popular appeal (they are NOT rare). So what’s a buyer to do? If you really want to be certain you won’t be hoodwinked into paying more than an item of jewelry is worth, build a relationship with a trustworthy jeweler/gemologist. Know with whom you are dealing–ask yourself, who is this person/these people? Also ask, what quality of people are these? How much do they really know about gemstones? How much integrity do they have? Do they honestly care about me and my needs? They think it’s despicable that anyone would try to deceive you into spending more on an item than it’s actually worth. Beware: Unless you are yourself an expert on gems, do not buy real jewelry from a mere facilitator/order-taker. These may be nice, honest people, but they are helpless to protect you from fraud because they lack that all-important gemologist knowledge. They will simply connect you to the choices in the display case or the catalogue, tell you the list price, and sell a piece to you. They possess little, if any knowledge of the actual piece in which you are investing. They can not apprise you of your piece’s unique characteristics, or tell you about the gemstone’s origin and rarity. They are not qualified to appraise your stone’s intrinsic value. They can only tell you what the company they represent told them. How do you feel about quality of a purchase? How do you know the value of what you’re getting? And how do you measure the integrity of the person you’re dealing with? Amazing information, Tracy. I don’t know how you found out all this information, but I do know you explain it very well. This couldn’t have come at a better time. We’re having some of my aunt’s jewelry evaluated and appraised, to be divided among her great-great-nieces. Now I feel semi-armed! I’m so glad it’s helpful, Marylin. I’ve been interested in jewelry for quite some time, and my husband is fairly knowledgable about antiques and gemstones, but the bulk of the information came from my interview with Craig at Gemstone’s Unveiled. I’m so impressed! Great informative article. You are a never-ending source of unusual and interesting facts. Thank you Elizabeth! I really am the lady with a million ideas! I have too many interests, but at least I can honestly say I’m never bored. Definitely pass the post on to Matt and tell him to look at the incredible prices at Gemstones Unveiled. REAL gems for less than what many places charge for costume and simulated stuff. In my dream job dream, I travel the world sleuthing out great buys on amazing gemstones to sell at my a private little jewelry store on Main Street. (Are there any jewelry stores left, on any Main Streets, anywhere? In my world, they’ve all closed down). The one I worked for was a little Main Street type jewelry store that unfortunately, went out-of-business. But with your dream job, bring jewelry back to Main Street! This is sound advice, Tracy. My father was a highly respected antique jeweller who ran his successful business in London’s west end. I am pleased to say that he became well known for his honesty and integrity within the trade and his customer base was world-wide. Sadly, the business died with him but I am hopeful that those who were taught by him and then moved on will carry that same honesty and feel for their craft as he did. It’s sad when so much knowledge passes away with our loved ones. But his integrity lives on– and I’m sure that someone who learned from him is carrying on the honesty, too. If I could do everything I want, in one of my incarnations I’d be dealing in antique jewelry. In London. I’m sure I would have admired your dad. Great info! Now if only I had the cash for some bling!